« September Is Magical Dining Month-Eat More For Less! 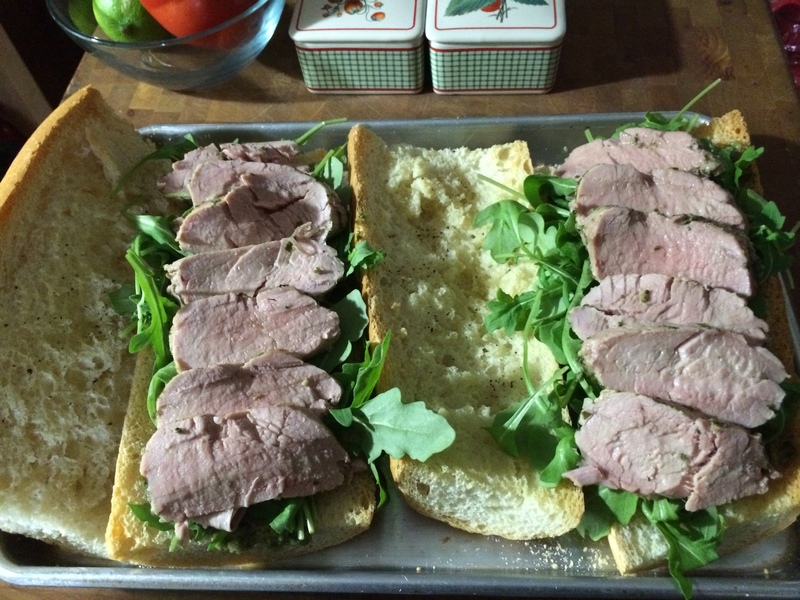 When I thought about what would make the ultimate sandwich, I knew sliced Roasted Pesto Pork Tenderloin Sandwiches would be perfect. To have alongside the sandwiches, my Rosemary And Garlic Potato Wedges. I’m a huge fan of fresh basil pesto, recently available in the refrigerated section of the grocery store. The name of the brand is called Buitoni Pesto. Now, I love to make my own pesto, when I have time, but for a weeknight meal, this store-bought fresh pesto works in a pinch and it’s really delicious. Preheat a cast iron skillet over medium heat. Carefully place the 4 strips of bacon, that had been cut in half into the hot skillets. Cook for 2 to 3 minutes on the first side then flip and brown the second side. Time may vary depending on how crispy you like your bacon. Turn the heat off and transfer the bacon onto a plate lined with paper towel. Set aside. Start by cutting the tenderloin in half. Place the two halves onto a baking sheet. Spoon on 2 tablespoons of the pesto on each half. 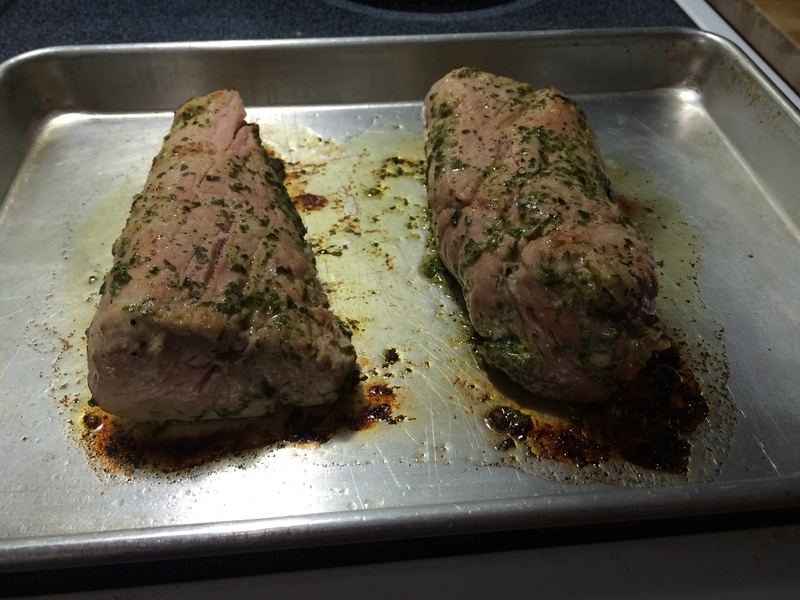 Massage the pesto all over the pork, transfer to the frig to marinate for 1 hour. 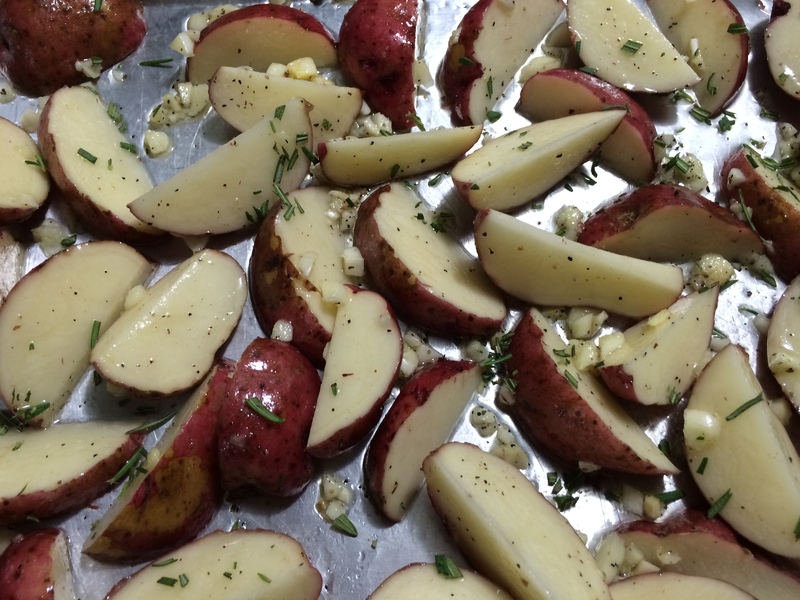 While that’s happening cut the potatoes into wedges, lay them out onto a baking sheet add a 1/4 cup of olive oil, fresh chopped rosemary leaves, 2 cloves of minced garlic, 1 tablespoon of Kosher salt, and 1 teaspoon of fresh black pepper. Using your hands toss the potatoes so everything is coated well with the oil, rosemary, and seasonings. Spread the potatoes into one even layer. Transfer the potato wedges to the oven and bake for 45 minutes. Halfway through, turn the potatoes to ensure they’ll be golden brown on both sides. Immediately sprinkle the hot potatoes wedges with Kosher salt to taste. When the potatoes are 3/4’s of the way done cooking remove the pork from the frig and bring to room temperature. Once the potatoes are in out of the oven, leave the oven at the same temperature, The pork will take no longer than 11 minutes to cook or an internal temperature of 145 degrees F. Cover with foil and allow to rest for 5 minutes before slicing. Adjust the oven temperature to 350-degrees F.
Cut the Cuban bread in half and then again in half lengthwise. Slathered both sides with butter, place them onto a baking sheet. Bake for 7 to 10 minutes or until a light golden brown. Once the bread comes out of the oven spread one side of each half with the remaining pesto. Next, add the arugula, the sliced pork, then the bacon, heirloom tomatoes, red onion, and finally the Fontina cheese. Place the top on and slice in half on the bias. There you have it. The ultimate pork sandwich with roasted rosemary, garlic potato wedges!